This week's excerpt is from a 1958 edition of Popular Science. A long read, but super-interesting. This article reflects the sense mystery and curiosity about the Moon at the time, making predictions of active volcanism, "the dark side", and even the possibility of life. It reads a bit like a travel brochure -- with the goal of igniting imaginations and rousing a romantic fascination with the Moon. Enjoy! Look hard, next full moon (April 3, May 3). Our oldest-established permanent satellite looms over the trees, familiar and close, yet mysterious and distant. Contrary to popular opinion, the moon is not always the same. And it's going to change more. We are ready to stretch across 240,000 miles to touch it, test it and put it to work - as an earth-encompassing observation post, as the staging area for expeditions through the universe. What is the moon like? We now know about just one side. Surprisingly, we know that side very well, better than some parts of the earth. Here are the facts: fascinating details painstakingly established, puzzling mysteries waiting for explorers to solve. Embark below for your armchair tour of Moon Number One. "Leibnitz Mountains. The highest peaks of all, outranking Everest... The Sea of Fertility. One of the larger seas of the Western Hemisphere... Newton. The Deepest of the craters... " Absorbed in the scenic wonders described in your guidebook, you may be unprepared for an outstanding impression of your first visit to the moon. That's the powder. A blanket of it covers everything, even steep slopes of jagged mountains. Perhaps a foot deep, the glassy stuff yields underfoot like quicksand, and you must learn the knack of getting in it. Static charges make it cling to your space suit and the window of your space helmet. Although fine as face powder, it isn't like dust, since there's virtually no air for it to float in. It's an odd sight to see the powder settle instantly, after you stir it up by wallowing through it or by skiing over it. What's on the moon -- the powder and the rest -- will become firsthand experience as soon as rocket ships begin plying outward from earth's man-made space stations. For it stands to reason that our nearest celestial neighbor, whose average distance is only 238,857 miles, will be the first one visited by spacemen. So declares a British astronomer, Patrick Moore, secretary of the British Astronomical Association's lunar section, and a leading member of the British Interplanetary Society. His book, A Guide to the Moon, offers would-be voyagers to Luna, by telescope or spaceship, a veritable travel manual. Places they should visit, and sights they'll see, are described in the light of recent findings. Pointed out, too, are mysteries of the moon that may be fully solved only when the first rocket ship blasts down to a landing: Is there life on the moon? Has it any atmosphere? Are volcanoes still active? What's on the other side? Today, these questions remain unanswered, even though the face of the moon that is turned toward us has been mapped better than the interior of Greenland. To an observer at the world's most powerful telescope, the moon appears on 24 miles away. The best photographs of its rugged and pitted surface reveal details only a few yards across. Enjoying such an excellent view of the moon's 2,160-mile-wide disk, astronomer have discerned more than 10,000 different features. Upward of 700 of the most prominent ones have received names. The moon's "seas", "oceans", "bays", and "marshes" once were believed to be sheets of water. Today we know there's no water on the moon, and these great dark areas are vast plains -- but early observers' fanciful names for them have stuck. Craters bear the names of scientists and other notables, past and present, with mythological characters thrown in; and some mountains are named after famous ranges on earth. 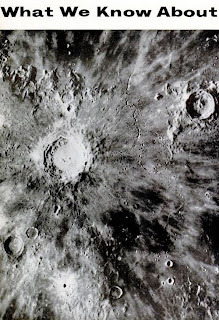 If explorers were ready to start for the moon today, they could take along splendid maps of these surface features. Probably the best, by Dr. H. P. Wilkins, British astronomer, was published in a 100-inch-diameter edition in 1951. And an expedition might do well to carry the latest maps! For astronomers no longer consider the moon, as they once did, a dead and changeless world. That view was held by the two foremost lunar observers of the nineteenth century, Wilhelm Beer and Dr. Johann Madler. They completed a lunar map and a book on the moon that were masterpieces of thorough work. They they quit. Why observe the moon further? 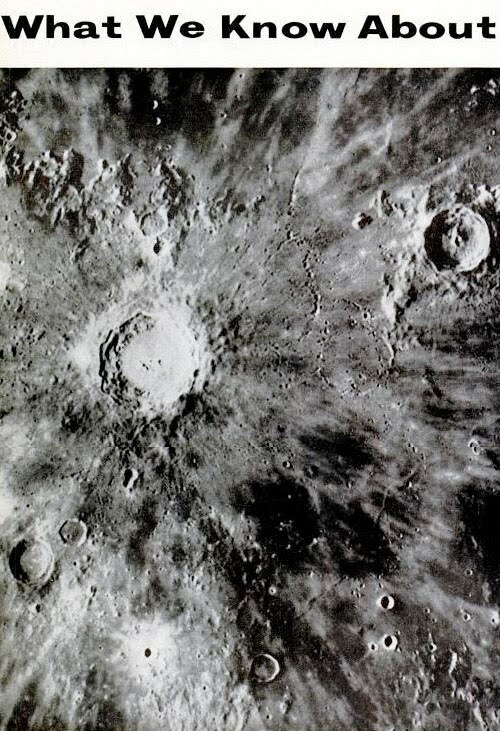 Thirty years later, however, an astronomer looked in vain for a deep six-mile-wide lunar crater called Linne that had been well known to them. Linne had vanished. Where it had been, there was only a white patch, which marks the spot to this day. The most likely guess of many is that landslides, triggered by a "moonquake," caved in the crater's walls and destroyed it. Imagine a moon explorer witnessing such a cataclysm at close range -- cliffs falling away, the lunar landscape changing before his eyes. It would be all the more awesome because it would happen in silence -- there cannot be enough air on the moon to carry a whisper of sound. Close observers have since found other mystifying developments on the moon. In 1939, Moore, the author of the lunar guidebook, himself observed a dense fog that filled a whole crater with a whitish mist. With no water to form clouds, what could the mist be? Carbon dioxide seems a reasonable guess to Moore. And since this gas is given off in volcanic eruptions, mists seen by him and others may mean the moon still has active volcanoes. The most remarkable object on the moon, perhaps, is the 29-mile-wide, 5,000-foot-deep crater Aristarchus. its central peak is the moon's brightest spot, even shining starlike after dark by reflected light from the earth. But still more interesting are dark bands, radiating like spokes from the central peak to the outer walls and up them. Mysteriously these markings wax and wane. They darken progressively outward after sunrise -- then shrink and fade toward the end of the weeks-long lunar "day". Through a powerful telescope, the gray-bordered dark streaks resemble the "canals" of Mars. Then is there life on the moon -- as the famous canals on Mars too may be signs of life? Along surface cracks of volcanic origin, Moore suggests, a primitive form of lunar vegetation -- lichens or mosses -- may develop under the sun's warming rays and revert to dormancy during the bitter-cold period of darkness. Volcanic carbon dioxide gas leaking from the fissures might sustain its existence. A lunar newspaper would have had sensational news to report in April, 1948. A tiny, brilliant flash of orange-yellow light was observed then just within the crater Plato. It must have marked the impact and explosion of a great meteorite -- perhaps as big as the one that struck Siberia in 1908 and leveled trees 20 miles away. A few similar observations are on record. But the most interesting thing about them is their extreme rarity. For if the moon had no atmosphere at all, it has been calculated, the flash of a 10-pound meteorite's impact would be seen yearly. Since we don't, is the moon totally "airless"? That the moon can have no more than a trace of atmosphere is evident from the usual absence of a lunar twilight (rare exceptions have been reported) and the lack of refraction or light-bending when the moon's edge obscures a star. But an atmosphere 1/10,000 as dense as the earth's, at surface level, could escape detection by such tests. Even so slight a trace -- which does exist, recent optical experiments suggest -- would have tremendous consequences. Imaginative accounts have pictured lunar explorers bombarded with death-dealing meteorites, and forced to take underground shelter. But a trace of atmosphere would suffice to form a "meteor screen" and burn up most meteors before they reached ground, as on earth. The rarity of observed flashes tends to confirm that this is just what happens. Powerful ultraviolet rays of sunlight, another hazard anticipated for spacemen on the moon, may likewise be filtered out by a lunar atmosphere. But still it must be so rarefied and devoid of oxygen as to be useless for breathing; explorers must bring oxygen along. Space suits and above-ground living quarters must be insulated against violent extremes of heat and cold -- the moon's surface temperature soars to 214 degrees when the sun is overhead, and plummets to 250 degrees below zero at night. Enduring such rigors may seems inconceivable to an earthman -- but on the moon, temperature loses its accustomed meaning, as there is practically no air to imprison you in a stifling blanket of heat, nor to drain the body's warmth with polar gales. A voyager disembarking upon the near side of the moon, and looking upward whence he came, will see a perpetually black, star-studded sky. The glowing earth -- four times as wide as the moon looks to us -- always hangs overhead, swaying only a little to and fro. And the sun, a blazing beacon, journeys so leisurely across the heavens that a day is about 29 times as long as on earth. In the sun's glaring rays, the lunar landscape will look as unreal as stage scenery under klieg lights -- dazzling highlights, black shadows. Explorers will need their courage to explore craters that reach 183-mile width and 29,000-foot depth. Rising like an island from the flat lava floor of the Ocean of Storms, majestic Copernicus, "Monarch of the Moon," measures 56 miles from crest to crest. Its ridged and gullied outer slope is a gentle one, and can be climbed with a little exertion, since a 150-lb man weighs only about 25 pounds on the moon. From its crest some future Daniel Boone may look down 17,000 feet, past masses of tumbled rock, into an inner amphitheater as large as Rhode Island. But when an explorer reaches the bottom center of a crater floor, the outer walls may seem to have shrunk or even vanished completely! Why? Because the moon's curvature, much sharper than the earth's, will sink most or all of the towering ramparts below his horizon. Lunar mountains surpass anything on earth in wild grandeur. For lack of any sea level with which to compare their altitude, it must be compared with nearby terrain. Loftiest of all by this standard, the Leibnitz Mountains near the south pole soar 35,000 feet, more than a mile higher than Mt. Everest. Strange and varied formations await sightseers: "clefts" or gaping cracks in the ground, surface swellings called "domes," and unexplained whitish "rays" extending from some craters -- perhaps streaks of volcanic ash from the last explosions of dying volcanoes. Impressive indeed will be the Straight Wall in the Sea of Clouds -- a sheer 800-foot cliff, 60 miles long. Its nearly vertical face remains blistering-hot after the ground has cooled: It gets the setting sun's rays head-on. Vividly the scenes will contrast with earthly landscapes -- for these gaping craters, these jagged mountains, have been untouched by wind, rain, or frost. These ancient scenes will look ghostly because nature has painted them in monotone -- shades of ash-gray and black shadow. But picture-takers bent on shooting color film may discover some exceptions. Most noteworthy is a short-lived ruddy glow, first seen in the 1830's near the little crater Lichtenberg. Once, in 1951, it lasted half an hour. Undoubtedly it's seen, the guidebook's author holds, when the sun's rays fall at a certain angle on "some unusual surface deposit" -- another first class mystery for future lunar explorers to investigate. - Adapted from an article by Alden Armagnac (PS, '53) and based on the book "A Guide to the Moon" by Patrick Moore.